Mercer et al. (1970) has reported a successful application of the specific ion exchanger clinoptilolite for removal of ammonium from municipal waste water. 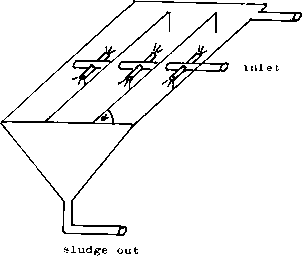 Jorgensen (1979) reported the possibilities of recovering ammonium (ammonia) from industrial waste water. It is clear from these examinations that recovery of the regenerant by air stripping seems important, because even the neutral regenerant will cause discharge problems. An economic analysis shows, moreover, that the recovery of the regenerant will in most cases more than pay for the cost of the recovery, as the air stripping of small volumes is relatively moderate in costs as discussed in Section 7.6. As already discussed in Section 7.6 the ammonia removed by stripping should be absorbed in sulfuric acid to avoid air pollution by the released ammonia. This implies that an entire chain of processes: ion exchange, recovery of regenerant and recovery of the air stripped ammonia as ammonium sulfate, must be applied. Figure 9.17 shows a flow chart of the described process chain. Gangneux et al. (1976). The removal of azo-dyes is required due to the strong color of the waste water, rather than to remove the nitrogenous compounds in the waste water, which are unimportant for the nitrogen balance in the receiving water. Proteins can be recovered from slaughterhouses, fish filleting plant, dairies and other food processing industries by use of a cellulose cation exchanger. The method has not found a wide application as chemical precipitations of these waste waters are sufficient to produce an effluent comparable to municipal waste water. The values of the proteins still in solution after this treatment are hardly able to pay for recovery of the proteins. It can, however, not be excluded that the process will be of increasing interest in the future due to lack of proteins and due to increasing charges imposed by the water authorities on industrial waste water effluents. Many industries discharge waste water with high concentrations of ammonium, as referred to in Section 7.6. Ion exchange is, however, not a very attractive treatment method for removal of high ammonium concentrations, because the regeneration becomes more frequent and the operation costs are very dependent on the elution frequency. As air stripping becomes more attractive the higher the concentration of ammonium is, these types of industrial waste waters are probably better treated by biological methods or by air stripping at least from an economic's point of view. Ion exchange is an attractive method particularly for concentrations up to 100 mg/l (Haralambous et al, 1992) and for waste water and drinking water, which do not contain sufficient organics to allow a biological treatment. Ion exchange has furthermore been applied for removal of ammonium from water in recycling aquaculture plants. The advantage Is here the low ammonium concentration, which makes it attractive to use ion exchange to concentrate the waste product, in this case ammonium, several thousand times. However, for all these applications of clinoptilolite, it is necessary to have sufficient contact time to allow the intracrystalline diffusion to take place; see Jorgensen (1979) and Neveu et al. (1985). Longer contact time brings about a reduced discrepancy between theoretical and practical capacity. A flow rate of 2-6 bedvolumes / h will in most cases correspond to the optimum contact time. Ion exchange has been used for removal of nitrate from drinking water; see for instance Dore et al., 1986. They used a strong base ion exchanger, regenerated by sodium chloride and were able to remove as much as almost 1 mole of nitrate per liter of resin at a low sulfate concentration. The selectivity to nitrate is, however, reduced by increased sulfate concentration. The standards for nitrate in drinking water (see Section 1.4) are exceeded for many ground water bore holes. The nitrate can, however, be removed by ion exchange, but as there is no ion exchanger, that is specific for nitrate take up, nitrate removal by this method is associated with high costs. As the ion exchange process has a high efficiency, the nitrate can easily be removed to a concentration far below the standards. To reduce the costs it is therefore possible to treat a fraction of the ground water by ion exchange and then to mix the treated and untreated water afterwards and still obtain a drinking water, that can meet the standards. Figure 9.17. 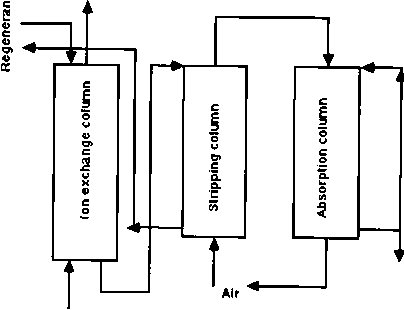 A flow chart of a combination of ion exchange, air stripping and absorption. The régénérant is recovered by air stripping, while the ammonia from the air stripping is utilized to produce a fertilizer, ammonium sulfate.